MEDIA RELEASE (June 4, 2018) In 2016, the Town converted 3,175 streetlights to LED (light-emitting diodes). The conversion resulted in $323,063 energy consumption and maintenance savings in 2017 when compared to 2015 results. “The project is expected to pay for itself in 7.5 years based on the current energy price. 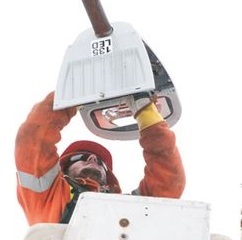 Since LED streetlights have a life expectancy of 25 years, energy consumption and maintenance savings should result in an additional $5.25 million from 2025 to 2041,” said Kelly Walsh, Director, Infrastructure Services. The $2.24 million LED streetlight conversion project was approved by Town Council as part of the 2015 Capital Budget. For more information about the Town’s LED Streetlight Conversion project, please contact Kelly Walsh, Director, Infrastructure Services, at kwalsh@forterie.ca or 905-871-1600, ext. 2400.